Many stories regarding three of ancient China's "four great inventions"-namely the compass, gunpowder and papermaking-are featured in an online exhibition launched by Google Arts & Culture on March 6. Eight Chinese cultural institutions, including the Palace Museum and the Art Museum of the Central Academy of Fine Arts in Beijing, are taking part in the digital exhibition. A documentary about contemporary artist Cai Guoqiang-who is known for creating art using gunpowder-and works by him also form part of the exhibition. 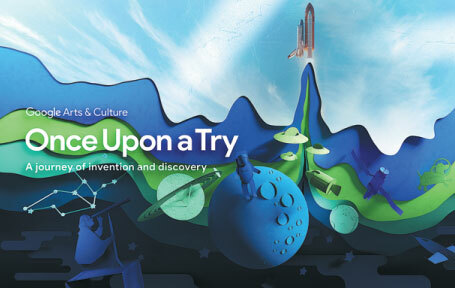 Under the name Once Upon a Try, the online exhibition is a tribute to the stories of humanity's great inventions and discoveries. Leading science centers such as the United States' National Aeronautics and Space Administration and the Swiss-based European Council for Nuclear Research are among the 119 partners from 23 countries that are taking part in the exhibition. The project is helping to raise the international profile of the Shu culture of Southwest China's Sichuan province globally, according to Zhang Heng, director of the publicity department of the Sichuan Museum. Shu is a Chinese character that refers to Sichuan. This is the first time collections from the Sichuan Museum and Wuzhen-the ancient water town in eastern Zhejiang province that's famous for hosting the annual World Internet Conference and Theater Festival-have appeared on the platform. A total of 192 exhibits about human creativity and inventions from the Sichuan Museum are on display, including items related to the Dujiangyan Irrigation System, a UNESCO world heritage site, and its prestigious collection of Shu brocades, compasses, brick reliefs from the Han Dynasty (206 BC-AD 220) and examples of guqin, the ancient Chinese seven-stringed zither. The first compasses date back to the Warring States Period (475-221 BC), while the earliest texts about their use in marine navigation appeared around the end of the 11th century. The compasses were first used in fortunetelling, sacred ceremonies and rituals, before being put to use in the fields of construction, farming, mining and the military. Compasses from the Sichuan Museum usually contain magnetite, a naturally magnetic mineral, and are shaped into wooden discs with patterns and characters inscribed in the concentric circles on them, conveying the ancient people's knowledge of constellations, chronology and the natural elements. Sixty one of the exhibits were shot using Google's high-definition system which captures images at a resolution of over a billion pixels. Zhang says she hopes the online exhibition will send a positive signal to young people interested in learning more about technology and improving their perception of human culture and civilizations. She expects more interactive activities to be launched in cooperation with the platform.